Sorry for disappearing for so long. I have been working on another very exciting project to popularize history that I hope to share with you guys soon. In the meantime, this post is a by-product of my struggles of re-educating myself of my own mother tongue. Before the middle of nineteenth century, Hindi had no patrons in India. The language was essentially a collection of dialects spoken in large swathes North India, but it held no formal recognition. Mughal Empire used Persian as the official language, which the British Raj had continued to a certain extent. Parallel to it were the native courts, which used Sanskrit. Sanskrit was an exclusive domain of the Brahmins, incomprehensible to both British and common Indians. Brahmins were happy hold back its spread to ensure their own continued influence. The first political patrons for Hindi emerged from the Hindu-Muslim antagonism that was building up in the country in late 1800s. These promoters of the language saw Hindi as a tool to counteract the influence of Muslims who spoke and read Urdu. 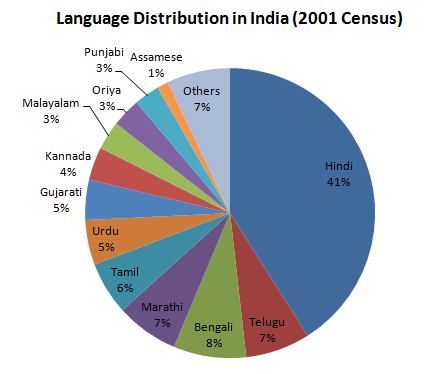 The initial attempt was spread Hindi as far as possible, in effort to claim most population and regions as Hindi speaking. Since Hindi was such a vague, ill-defined group of dialects, an easy way to do this was claim other languages as Hindi. The direct victims of this strategy became border regions like Rajasthan, Bihar, Himachal and Uttarakhand. Many linguist experts maintain that Rajasthani, Bihari and Pahari should be a different language group. But all this was swept aside in a campaign to spread Hindi. So, for instance, in 1881 Bihar Government adopted Hindi as the sole official language of the state, ignoring, not only Urdu but also Maithili, Bhojpuri etc. A lot of government work and education programmes were transferred to Hindi medium. Over the decades, this situation ensured that most Biharis, regardless of their mother tongue, end up becoming Hindi speakers. Such efforts continued across North India, with much success, except in Punjab, where Sikhs, with the force of their religion, were able to consolidate a counteracting force.